Me getting my “om” on in Times Square! The last couple of weeks have been a whirlwind of activity between work, life and you know—trying to fit in a fun activity or two. My summer has been a little too busy for my taste but I am hoping things will settle down soon and I can better about staying in touch. So let me tell you about a few things happening in my world and then I want to hear what is going on with you! Without further ado—let’s get to this week’s main post! 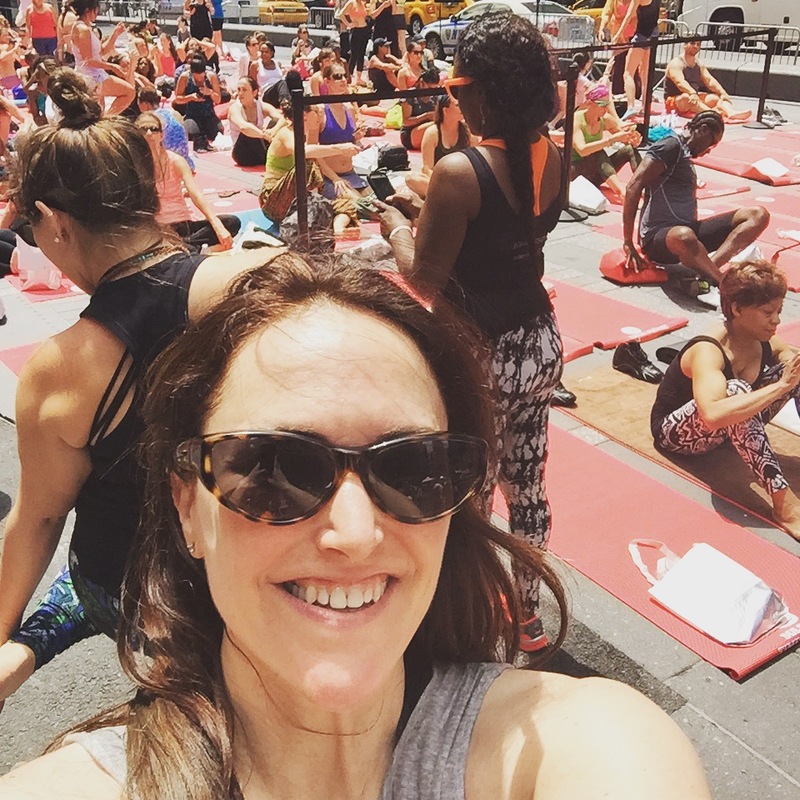 Yoga in Times Square (For Reals! ): June 21, 2015 was declared the world’s first “International Day of Yoga” with fabulous Zen-like events taking place around the globe including the annual Summer Solstice in Times Square which I covered a few years ago for Fit Bottomed Girls. It was so magical that when I had the chance to once again go into the middle of NYC and do some yoga on a hot summer afternoon—I jumped at it. It is indescribable the feeling of trying out the mountain pose or a backward bend and being in the middle of one of the most celebrated places in the world. Somehow in the heat, humidity, car noises and usual tourists rambling about we were able to find a peaceful place in our minds. I wish I had taken more photos but I was just so caught up in the moment that I only have these to share with you. Next time you will all just have to out here with me to see it for yourself! Did you celebrate International Day of Yoga? Where were you and what classes did you take? Book Vs Movie Podcast News: Margo Porras of Shes Nacho Mama’s Blog co-host the “Book Vs. Movie” podcast (that you can subscribe to via iTunes at this link) had planned to record our first “80s” era episode with the classic Less Than Zero when Amazon Prime decided to NOT ship her DVD in time (grrr.) Have no fear—we will record that podcast very soon because we are both DYING to talk about Andrew McCarthy and James Spader but it gave us an opportunity to turn to the vaults. Did you read/see The Help? What did you think of it? I have the link below if you want to check it out for yourself. We are planning our next episodes so if there are any books & movies you want us to cover—feel free to comment below! Fit Bottomed Girls Playlist: I am lucky enough to write for Fit Bottomed Girls and this past week they had their annual “BFF” (Best Friend Forever) celebration where they talked about how amazing (and much needed) a BFF is on our lives ( I certainly love mine!) So I put together the BFF Workout Playlist and wanted to ask you—what song reminds you of your BFF? What would you add to my list? Terry Bikes Ambassador: Those of you who know me know that I am a woman who loves her bike and try to ride it as often as I can. Terry Bikes makes the best riding gear for women who are serious athletes and the cutest (and appropriate) streetwear for ladies who like to look effortlessly chic on a bike. Being their Brand Ambassador means I get to try out new gear form time to time which is THE BEST! In return I write them some Blog posts form time to time and in this one I talk about my favorite places to ride in NYC. Where do you go bike riding? This entry was posted in Uncategorized and tagged "Best Bike Rides in NYC", "Less Than Zero', Book vs Movie "Less than Zero", Book Vs Movie "The Help", Book Vs. Movie podcast, Fit Bottomed Girls, Solstice in Times Square, Terry Bikes, The BFF Playlist, yoga by brooklynfitchick. Bookmark the permalink. How did I miss International Yoga Day?!? Now I’m kicking myself for this! 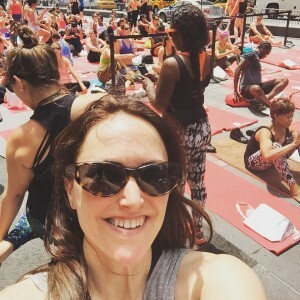 I went to the Yoga In Times Square Event last year – it was super cool to get my zen on in the middle of such a crazy part of the city. Also The Help – this is actually probably the only case where I liked the movie better than the book! yoga in Times Square! How cool. I’m not much of a yogi as you can tell by my post today but that I would do! Yoga in Times Square looks AMAZING, so cool!!!! how fabulous – yoga in Times Square! we had a few events going on here for international yoga day in DC! 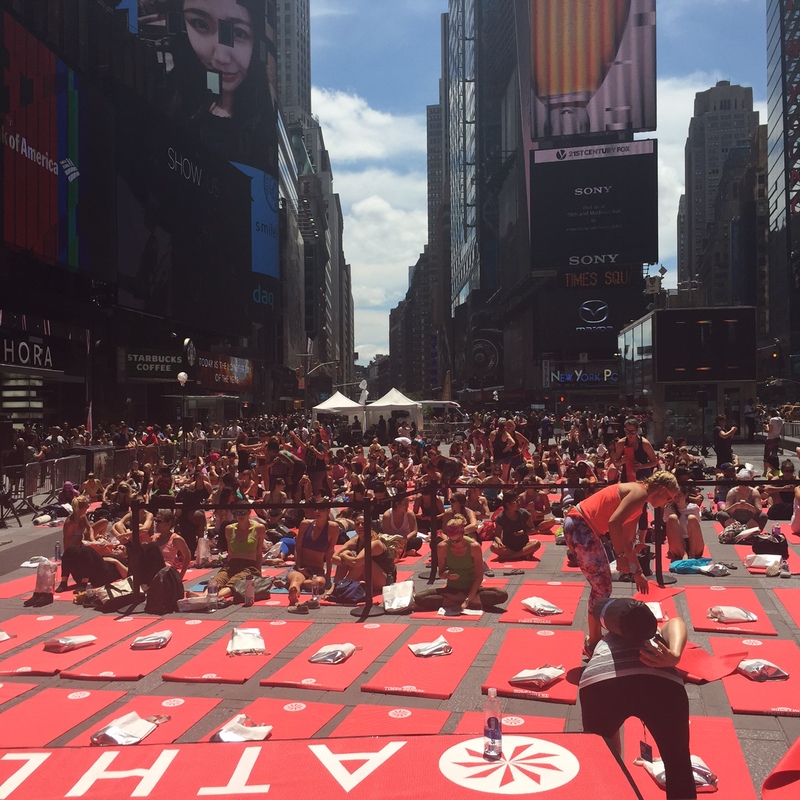 What an incredible experience – yoga in Times Square! International day of yoga was awesome- I led a meditation class! Been thinking of you & hoping you are doing OK – HUGS! I didn’t know that there was an international yoga day! I feel like a bad yogi. It was a fun, busy day! YOGA in TImes Square looks absolutely amazing!!!!! I wish I could have attended. yoga in Times Square would be amazing!! Yoga in Times Square it’s amazing, i love yoga.